West Cornwall's leading Independent Estate agent with five offices locally & links to over 1,300 nationwide. Please contact us for any property related query, whether you are looking to buy, sell, rent or let. Click the links below watch videos of the area. We had exemplary support from Marshalls over the course of a year of trying to sell our property. Simon Phillips was exceptional. He was conscientious to a fault and overcame several obstacles even offering solutions to the problems before they occurred. 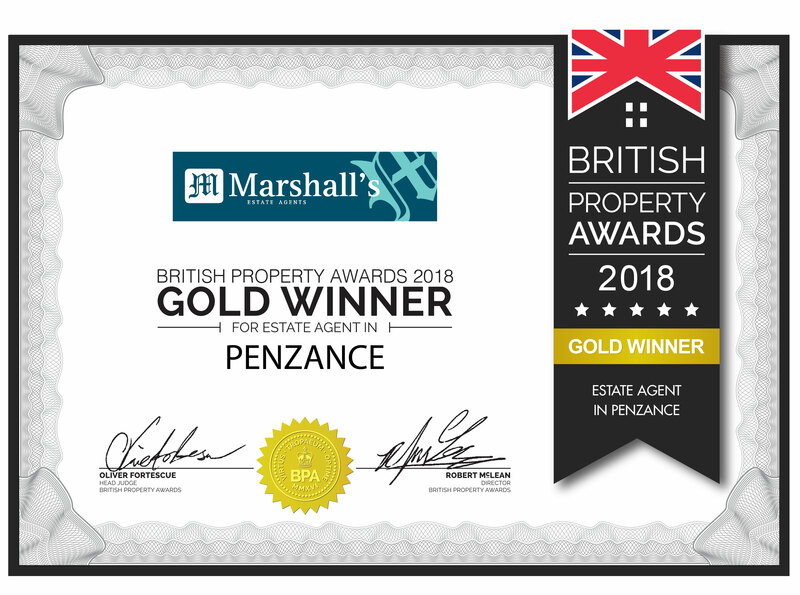 We would highly recommend all the staff at the Penzance office as being helpful and knowledgeable. What a breath of fresh air!! These agents act like real people and treat you accordingly. Although we are sorry to say, we did not buy a property though them in the end, their indepenent mortgage advisor is excellent. He took all the stress out of looking for the right mortgage for us and actually saved us money. What more can anyone ask for?!! I was very satisfied with David Marshall and Louise Mead who were both enthusiastic about the property and they made sure that people were shown around the property as often as possible. The property was empty and they made regular visits to ensure that all was OK and they also did meter readings for me and let my builders in as I was not able to be present for this as I live some distance from the property. I would certainly recommend them to others and I have done so in the past. The moment my call was answered I met the most professional, friendly and considerate agents in Zoe and Kathy. Every detail was explained and managed smoothly. Kathy is somebody who really listens and understands ones concerns on a personal level. Zoe also gave me confidence and great support, and her laugh is infectious. All calls were proficiently and professionally managed between ourselves and the buyers. Selling our home with Marshalls from Hayle has been a successful transaction which I give full credit to Zoe and Kathy. Thank you also to Liam for his calm re-assurances. Now they look for a new home for myself. A huge hug from me with many many thank you's! I received an excellent service during the time Marshalls marketed my property for me. The property had been on the market for a number of years with other agents without any offers, despite the price having being dropped dramatically. Marshalls provided a well thought out and well executed marketing strategy which produced results and a purchaser was found within months. Marshalls consulted with me and kept me well informed at every stage of the process (I live in another area of the Country) and offered a very professional, courteous and efficient service at all times. I can thoroughly recommend them and would not hesitate to use them again. Out of all the estate agents I was with, I only received details from Marshall's, I had daily emails from Emma, especially more detailed emails for a property which was not on rightmove yet. And I was posted details, Marshall was the only one who did this. If I sell in future then this is who I will use, they market property's really well. Excellent from start to finish. Really. Completely 'got' my property and found the right buyer quickly. Mine was a leasehold and the shenannigans with solicitors were time consuming and frustrating at times but Simon was proactive and positive right up to the point of Exchange of Contracts. Would highly recommend. I would like to thank you and everyone who has helped with the sale for a job well done! It does pay to use an Estate agent with local knowledge. If you would like someone to contact you for a free valuation and market appraisal, please provide your details here.